An insightful report from Lichfield Junior Daniel Barnes a recipient of WMCCL funding. 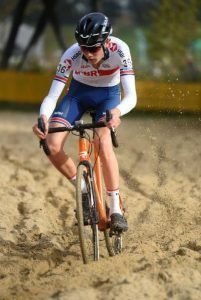 This weekend I raced for Great Britain in Belgium which was as a result of my 4th place 2 weeks ago at Derby National Trophy. We travelled on Friday to the GB house in Zottegem arriving late. We had an early start but got to the Super Prestige race in Boom in time for 2 recce laps before our race at 11:50. The course was really dry and dusty and super hard with lots of climbs. The course was one of the toughest I’ve ever ridden with sand pits, a run-up, hurdles and a bridge which was all really cool to ride. I was gridded 2 nd row but got a bad start so was in about 15 th after a lap with my legs feeling awful and then kept losing positions throughout the race until the last 2 laps where I gained a couple of places back into an eventual 26th which was very disappointing because I was hoping for much better but seemed to have awful legs on the day. We then stayed to watch the elites race and support the junior GB girls in their race which was really good fun with all of the top riders there. This race wasn’t in a big series like Saturday and was of a slightly lower standard. We raced at 3 o’clock so had plenty of practice laps on another dry and dusty course with sand like Saturday. I was gridded at the back row but after a lap got into 4 th then got caught by a couple of GB riders who didn’t have such a good start so ended up finishing 7 th . I was happy with this result and had much better legs than at Boom. This trip was an amazing experience thanks to British Cycling and Mudiiita and I’m looking forward to the rest of the season with hopes to represent GB again.